Join us for our annual celebration of our talented youth and their equally talented instructors. Join local artist Mirja Vahala as she leads everyone step by step to you help create your unique version of this painting. Tickets available up to Friday MAY 10 so contact us soon to purchase them. 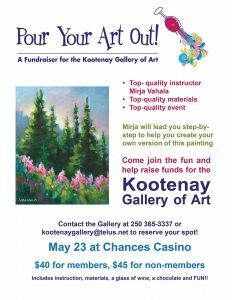 Call 250 365 3337 or email kootenaygallery@telus.net to purchase tickets. Includes instruction, all materials, a glass of wine and a Doodlebug chocolate. 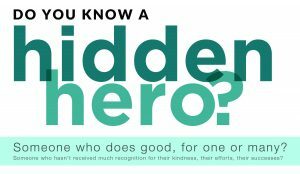 Castlegar and area residents nominated a number of heroes via drop off points in town and at the Gallery, by phone and by completing a form on the website. Thank you to all the people who nominated our heroes. 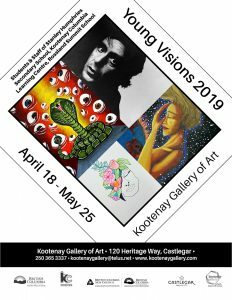 The resulting portraits will be shown in an exhibition at Kootenay Gallery in the summer of 2019. For more details, visit hiddenheroproject.ca or contact the Kootenay Gallery at 250 365 3337/ kootenaygallery@telus.net. 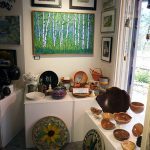 We offer a large selection of jewelry, in a range of prices, pottery by many of the ceramic artists in our region, a large selection of paintings and prints, glass work, wood work, knitted and woven goods and more! We are so lucky to have a group of visionary and committed people helping us govern and lead the work of the Gallery. 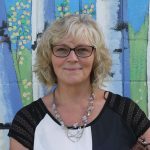 Here is a feature on our Board Member Judy Madelung so you can get to know her better and understand the work she is involved with at the Gallery. Read it here. You can rent the large gallery, the small gallery or both. You can rent the workshop room for meetings or classes. The Gallery has been rented for meetings, seminars, business lunches, community events, a birthday party, a wedding shower and even a wedding. 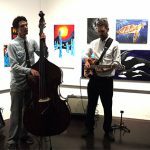 It is a privilege for us at the Gallery to work with artists to bring exhibitions to the community each year. We hope the work we present is stimulating and inspiring. The schedule we are presenting this year offers art focused on the visitor experience with artists from away and from here. 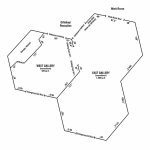 The 2019 exhibition schedule is available here.